Hurry over to get this InnoGear 2nd Version Aromatherapy Essential Oil Diffuser on sale for just $13.29! I purchased this a few years ago and it works GREAT! -This diffuser fills your space with a lovely fragrance that can lift the mood and relieve stress from stressful and tired day, perfect for masking stubborn smoking and pet odors. -Whisper-Quiet Ultrasonic Operation – humidify your living space to prevent dry, stuffy air and flu/cold germs infecting your loved ones. Prevent dry and chapped skin in dry winter months. 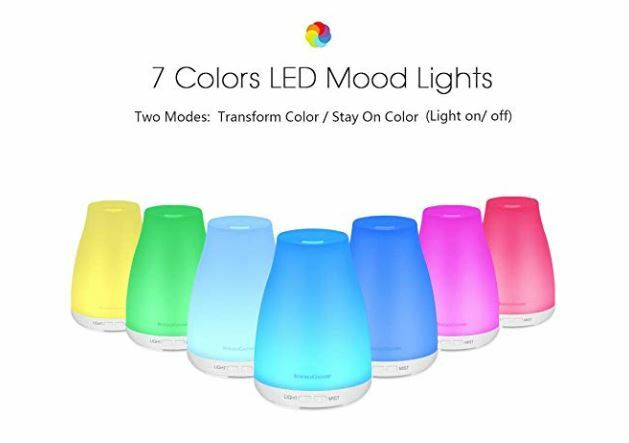 -Aroma Diffuser Spark Your Kid's Imagination with 7 Changing Mood Lights, each of which is adjustable between Bright and Dim modes, and could be set steady on. Great night light for young children scared of the dark at bedtime. Color including: Green, Dark blue, Red, Yellow, Pink, Light blue, White. -Oil Diffuser Shuts Off Automatically When The Water Runs Out. Portable for Home, Yoga, Office, Spa, Bedroom, Baby Room. Perfect gift idea for family and friends who love aromatherapy or can benefit from Aromatherapy healing. -Three Working Modes: Intermittent Mist(30 seconds on/30 seconds off), Continuous Mist, Lights only. Working Time: 7-9 hours in continuous mode, 9-11 hours in intermittent mode.